The madness before the madness is upon us. Before the masses of hoop fans fill out their brackets, make their wagers, and figure out how to make wall-to-wall basketball viewing at their desk look like work, the conference tournaments must first help shake out the seeding, and burst some bubbles. And the most compelling one might just be held in the shadow of the Space Needle, with this weekend’s Pac-12 Tournament. With six teams likely moving on to the field of 64, four of which should likely notch a top-four seed, plenty of talent should be on display at Key Arena in Seattle. Make no mistake, that talent isn’t limited to the teams pegged for a deep NCAA run. Up and down the slate of games this weekend, some of the most explosive players in all of college basketball will take to the court to determine just who is the best of the conference. And if the last two years are any indication, we may not see the top two seeds on Sunday night. Talk about parity. Sophomore forward Emily Potter puts up two for Utah. Photo by Steve Wilson/University of Utah Athletics. #7 Utah vs. #10 California — 11:30 a.m. The first game of the tournament pits the two most-evenly matched offenses in the conference against each other, with both teams averaging exactly 67.4 points per game. Utah won both regular season match ups, including a 19-point second half comeback against the then-No.21 Bears on Jan. 10 in Berkeley. If Cal is to prevent a third loss at the hands of the Utes, they’ll have to defend better: Utah shot over 50 percent from the field in both games. But even with a defense in the bottom third of the conference, Cal opponents were averaging just over 40 percent during the season. Forward Kristine Anigwe, second in the Pac-12 in scoring at 20.3 points a game and sixth in rebounding at 8.9, has burst into the college basketball consciousness with a strong freshman campaign for Cal. If guards Asha Thomas and Gabby Green, both among the top five in the conference in assists, can consistently get the ball to Anigwe, it may be the Bears’ best shot to get their first Pac-12 win away from Haas Pavilion. But standing in the way is 6-foot-6 forward Emily Potter and 6-foot-1 wing Paige Crozon. The Utah duo — both in the top 15 in scoring and top 10 in rebounding in the Pac-12 — has been one of the most effective one-two punches in the conference. Both teams are on the outside looking in to make the field of 64, and likely need to win the tournament outright to earn a bid. But a loss would be one final disappointment in a season filled with them for a Cal team with big expectations, in a year where they had been ranked as high as No. 16 in the nation. Missing the tournament would snap a four-year streak. If they don’t, the senior-less squad brings everyone back next season. Don’t underestimate the power of continuity in 2016-17. 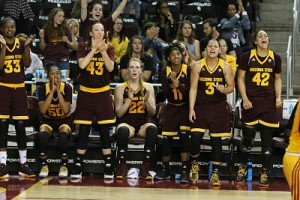 Arizona State has spent most of the 2015-2016 season ranked in the top 10. Photo courtesy of Arizona State Athletics. The only question for the Sun Devils is if they can grab a No. 2 seed in the NCAA Tournament. A loss to UCLA to end the regular season may have dashed those hopes, but for a team that has only lost three times since the start of December, asserting conference superiority with three more wins could be enough. If the Sun Devils can continue to play the stifling defense that kept Pac-12 opponents under 50 points in 12 games, and under 65 in all but three, they’ll have no trouble in their second round match up, but the Bruins loom in a potential third-round rematch. In the loss to UCLA, the Sun Devils were derailed by poor 3-point shooting, and early first-half foul trouble for starting guards Katie Hempen and Elisha Davis. If they can avoid those problems, and Sophie Brunner can turn in another double-double performance, ASU can flip the script in the potential rematch. To get there, they have to dispatch either a Utah team they beat by 20 in Tempe, or a Cal side they beat by eight at home, and 15 on the road. #6 Oregon vs. #11 Arizona — 2 p.m.
An up-and-down conference campaign for the Ducks hit a new low last week with senior forward Jillian Alleyne’s season-ending torn ACL. With that in mind, disregard the previous match ups, this game will be an entirely different beast without one of the best college players in the country. With the Ducks squarely on the bubble, a win is a must, if not two. And if the team’s final two conference games without Alleyne are any indication, it may be a tall task. 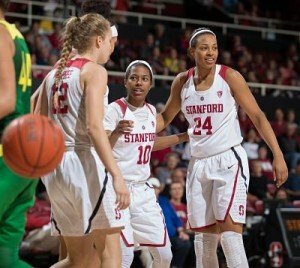 An 11-point loss to Cal, followed by an almost-30-point blowout at the hands of Stanford were also the first time since back-to-back losses to Oregon State in early January where the Ducks failed to eclipse the 55-point mark. At least one of Lexi Petersen, Maite Cazorla, or Lexi Bando will have to pick up the scoring slack, but with no other Oregon player in the top-20 in the conference in rebounding, it may be difficult to maintain any advantage on the glass. Of course, if their shots are falling, it won’t matter quite as much. It’s been a rough year for the Wildcats, who ended an 11-game losing streak with a win against USC on Sunday. Junior LaBrittney Jones has been a bright spot in the post, and freshman Taryn Griffey has established herself as a credible 3-point threat, but anything less than one-and-done for Arizona would be considered a massive upset. Kennedy Burke gets the rebound as teammate Monique Billings looks on. Photo by Percy Anderson. 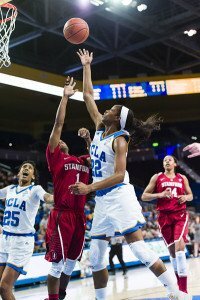 UCLA defeated the Ducks by 11 in Los Angeles, and by five in Eugene — both games in which Alleyne finished with a double-double — while the Bruins easily dispatched the Wildcats by more than 25 points in both games. A second-round win would mean a rematch with an Arizona State team that the Bruins defeated on Sunday. Without Alleyne, All-Pac-12 guards Nirra Fields and Jordin Canada should have an easier time driving to the basket, and with a +5 rebounding margin during the season, second-chance points should also be easier to come by in a match up with Oregon. Above all that, history just might be on UCLA’s side as well. Since the tournament first came to Key Arena, the No. 3 seed has made the championship game each year. Winners of six of their last seven, the Bruins also appear to be peaking at just the right time. #8 USC vs. #9 Washington State — 6 p.m.
At first glance, this match up may not be as close as the seeding would have many believe. With a scoring margin of 8.5 per game, the Trojans aren’t in the upper tier of the conference, but it does put them ahead of the Cougars at -0.2. But the two teams have played each other close, with both sides winning at home (WSU by eight, USC by two). If you believe in momentum, the Trojans are losers of six of their last seven, while the Cougars took care of business with a buzzer-beater against Arizona and win over Colorado, before losing their regular season finale to Utah. Of course, even that stretch came after an 8-game losing streak. 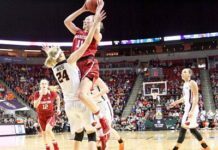 Freshman Borislava Hrisotva has been a revelation for Washington State, averaging just over 16 points a night, but there hasn’t been enough behind her to propel the Cougars. WSU is in the bottom half of the conference in nearly every major statistical category, aside from blocks (6th), turnover margin (4th), and steals (2nd). USC doesn’t fare much better, but should posses an advantage on the defensive boards (4th in the Pac-12). And the only team ahead of the Cougars in steals? The Trojans. Chances are, this result will depend on who takes better care of the basketball. Jamie Weisner drives the ball up court. Photo by Scobel Wiggins/Oregon State Athletics. With 11 wins by 10 points or more (six by at least 20), the Beavers have been a buzzsaw for Pac-12 opponents. But, as evidenced by a 22-point defeat at the hands of Stanford on Friday, they’re not unstoppable. Of course, beating Oregon State is a tall task. Literally. 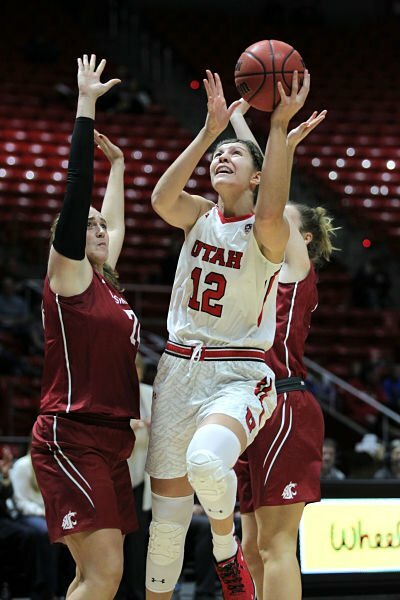 6-foot-6 center Ruth Hamblin, a likely first-round pick in April’s WNBA draft and three-time Pac-12 All-Defensive Team selection, will make things difficult for anyone in the paint, on both sides of the floor. 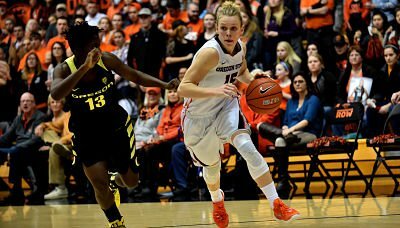 Guards Sydney Wiese and Jamie Weisner — both All-Pac-12 selections — make for a strong back court, and pair with Hamblin to create a team that can beat nearly anyone in the country from outside and in the paint. The Beavers defeated USC by eight in Los Angeles, and by 24 at home, while beating the Cougars by nine in their only match up in Pullman. #5 Washington vs. #12 Colorado — 8:30 p.m.
For a team that has to travel just a few miles from campus, the Pac-12 Tournament hasn’t been kind to Washington. In the last three years, the Huskies have failed to play past the second night, with Friday defeats in 2013 and 2015, and a first round loss in 2014. They’ll start this year’s tournament run with the nightcap against the Buffaloes, a rematch of Saturday’s regular season finale for both teams, which the Huskies dominated start to finish. 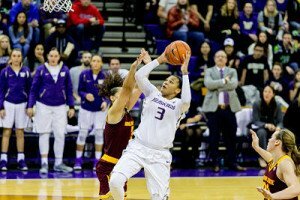 While you can etch in stone a 20-point night (at least) for guard Kelsey Plum — her season-low is 18 — the fate of Huskies may be in the hands of forward Talia Walton. If she shoots well, the UW should have little trouble dispatching of the Buffaloes. If not, it might not be so simple. 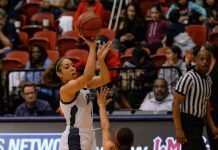 Since the loss of guard Brianna Ruiz to a season-ending knee injury, the Huskies have relied heavily on their starters, with even the first player off the bench (either guard Kelli Kingma or forward Mathilde Gilling) rarely playing more than 10 minutes. An off night for at least one starter could mean trouble. Meanwhile, Colorado’s trio of top-25 conference scorers in Haley Smith, Jamee Swan, and Kennedy Leonard will likely need to have big nights to give the Buffaloes their third conference win of the year. Winners of nine of their last 10, the Cardinal are arguably the hottest team in the conference, and at just the right time. That’s in no small part due to dual threats Lili Thompson and Erica McCall. Both averaging 14 points a night, Thompson has opened the offense with 3.5 assists per game, while McCall has been one of the Pac-12’s top rebounders with more than nine each night (mostly on the defensive glass). Sadly, Thompson might also have a little extra motivation. 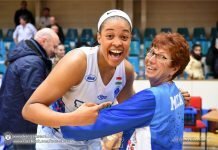 She missed the team’s last regular season game to attend the funeral of a family member. The Cardinal beat the Huskies 69-53 in their lone meeting in Palo Alto, while knocking off Colorado 71-56 at home, and 80-49 on the road. Semifinal games are at 6 p.m. and 8:30 p.m. on Saturday night, and the championship is Sunday at 6 p.m. The first three rounds will be televised on Pac-12 Networks, with the championship on ESPN.